SpaceAge Fingertip Regeneration - Stem Cell Activation Therapy . Nano Silver Induced Stem Cell Activation. Reduces risk of amputation of Diabetic Foot. Nano Silver Induced Stem Cell Activation has helped recreate an entire Fingertip, complete with fingernail and fingerprint in a record period of as little as 21 days. "The amputation of a fingertip – by a car door, lawn mower, electric fan, or whatever – is one of the most common childhood injuries. The standard treatment is to smooth the exposed bone and stitch the skin closed, or, if the digit has been retrieved and was cleanly cut, to try to reattach it by microsurgery. The sad fact is that even the most painstaking surgery gives less than optimal results. The nails are usually deformed or missing, and the fingers are short and often painful, with a diminished or absent sense of touch." "In the early 1970s at the emergency room of Sheffield Children’s Hospital in England, one youngster with such an injury benefited from a clerical mixup. The attending physician dressed the wound, but the customary referral to a surgeon for closure was never made. When the error was caught a few days later, surgeon Cynthia Illingworth noticed that the fingertip was regenerating! She merely watched nature takes its course." "Illingworth began treating other children with such “neglect,” and by 1974 she’d documented several hundred regrown fingertips, all in children eleven years old or younger. Other clinical studies have since confirmed that young children’s fingers cleanly sheared off beyond the outermost crease of the outermost joint will invariably regrow perfectly in about three months. This crease seems to be a sharp dividing line, with no intermediate zone between perfect restoration and none at all." "Some pediatric surgeons, like Michael Bleicher of New York’s Mount Sinai Hospital, have become so confident in the infallibility of the process that they’ll finish amputating a fingertip that’s just hanging by a bit of flesh. A lost one will regenerate as good as new, whereas one that has merely been mutilated will heal as a stump or with heavy scarring." "Fingertip regrowth is true multitissue regeneration. A blastema appears and redifferentiates into bone, cartilage, tendon, blood vessels, skin, nail, cuticle, fingerprint, motor nerve, and the half-dozen specialized sensory-nerve ending in the skin. Like limb regeneration in salamanders, this process only occurs if the wound isn’t covered by a flap of skin, as in the usual surgical treatment. Illingworth and her co-worker Anthony Barker have since measured a negative current of injury leaving the stump." "Sadly, natural replacement has been accepted only at a few hospitals. Bleicher laments his colleagues’ resistance to the evidence: “Mention it to young residents just out of the training program, and they look at you as though you’re crazy. Describe it on grand rounds or at other institutions, and they tell you it’s hogwash.” Nearly all surgeons cling instead to flashier and vastly more expensive yet less effective microsurgical techniques or simple stitches and stunted fingers." "This discovery and our own research indicated that the potential for at least some artificial regeneration was clearly quite good in young mammals. But what about the ones who needed it most - us older folks whose parts were more likely to be injured or broken down? The answer came unexpectedly several years later, in a way that showed the futility of adhering too rigidly to one’s original plan. The scientist must be free to follow unexpected paths as they appear." Extract reproduced from "The Body Electric" by Professor Robert O. Becker, M.D., Orthopedic Surgeon, State University of New York, Syracuse, New York, 1985. "One of the most common childhood accidents is injury to a fingertip. The standard surgical procedure is to either suture a skin flap or if the fingertip has been retrieved, to try to attach it and hope for the best. Many times microsurgery is resorted to, to ensure the success and full functionality of the finger. However, in many cases this fails and the digit eventually just falls off. Those that do succeed, end up with either a shorter finger, a deformed / missing nail or with sensory loss of touch." "Fingertip regrowth is a true composite tissue regeneration involving regeneration of bone, cartilage, tendon, blood vessels, skin, nail, cuticle, fingerprint, and half a dozen of specialized sensory nerve endings." "Of great interest is the present case study of “Fingertip Regrowth After Amputation.” In this case, the entire fingernail and fingerprint have been recreated in only 30 days compared to the previous documented case in 1995, using silver which required a period of 90 days. This is accomplished entirely by a non-surgical procedure with a much higher success rate than mainstream surgical procedures." "Such an efficient and rapid regeneration is unprecedented. The closest attempt is a previous world record of 90 days for full regrowth using silver. (10 – Pages 155 - 156) This is set in 1995 by the late Dr. Robert O. Becker at the State University of New York, and recorded in US Patent 5,814,094 (3)." "A fingernail in the human body normally grows at a steady pace which requires five to six months to replace its entire length (8). If the same length can be regenerated in only a 30 day period, it demonstrates the accelerated healing and regenerative capabilities of nano silver induced stem cell activation therapy. It also demonstrates improvements in activation techniques during the past few years which have made such incredible results a reality." "The ability of nano silver stem cell activators to dedifferentiate mature cells gives us the ability to produce more stem cells and consequently more progenitor cells than the body does under normal circumstances. (1) In addition, this ability of nano silver to stimulate all pre-existing stem cells to enhance the rate of production of progenitor cells results in an eventual regeneration of the fingertip in an unbelievably short span of time of 30 days. (2) This is roughly five times faster than the unaided body really can achieve. This clearly demonstrates an approximately five-fold accelerated healing and regenerative capabilities of nano silver stem cell activation." "The fingertip regeneration process occurs only if the wound is left uncovered by a flap of skin. (10 – Page 156) This is quite contradictory to the standard surgical procedure in mainstream medicine. This is a major deviation in the thinking process for present day surgeons who would prefer to react to such situations by resorting to simple stitches or microsurgical techniques." "Such cases of fingertip regrowth strongly suggests that the human body does have the ability to regenerate body parts given the right stimulus." "Future developments in the application of stem cell activation could conceivably extend to making limb regeneration a reality." "A seven year old boy suffered fingertip injury to the right hand middle finger. The amputated piece was sutured back as a free composite graft by the general surgeon. Inspection on the fifth day showed that the fingertip was totally nonviable, but the patient was not cooperative and did not allow the graft to be removed. The patient was treated from the third day onwards with topical nano silver stem cell activators over the mentioned site of injury without removal of the graft." "Within two weeks of topical application of nano silver stem cell activators, the free composite graft finally fell off on its own." 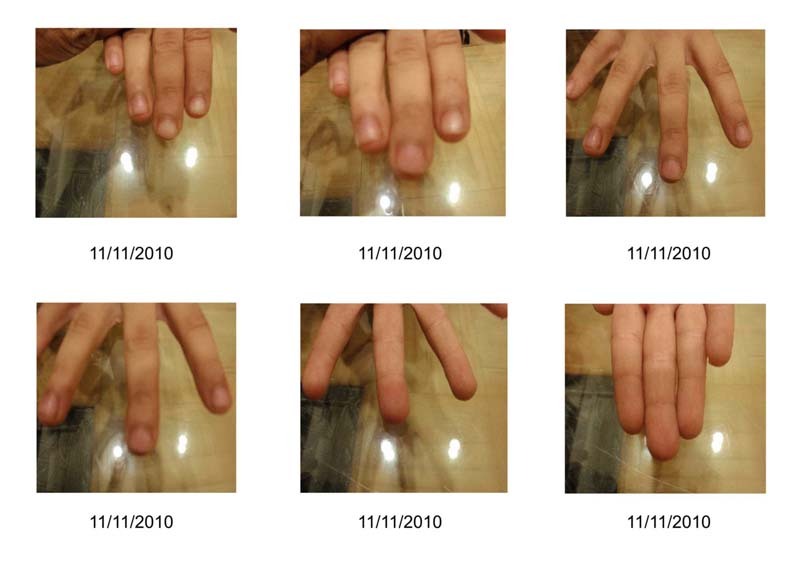 Complete regrowth of the entire fingertip occurred in four weeks without any permanent deformity. Will this child remember when he becomes an adult, which fingertip on which hand was accidentally amputated? Six months later, there is no trace of a scar or deformity left to indicate his fingertip was accidentally amputated. The nightmare is really over! One of the most important differences between an eleven year old child and a fully grown adult, as far as regenerative medicine is concerned, is the levels of growth hormones in their bodies. 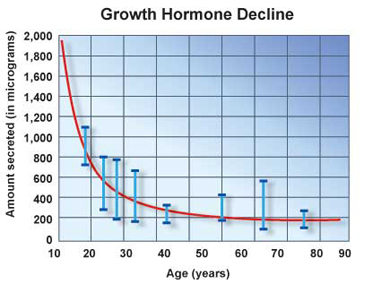 Growth hormone levels rapidly decline after the age of 11 years. In order to improve the scope of application for the fingertip regenerative techniques discussed above, and to take them past the earlier age barrier of 11 years (proposed by the late Dr. Robert O. Becker, M.D. in his book The Body Electric, 1985), one must find the means to naturally increase and maintain growth hormone levels in the human body during the first few critical weeks or months when the regeneration of the fingertip is to occur. Amino acids such as arginine are known to cause the pituitary gland to naturally secrete growth hormones at an enhanced rate. Incorporating the use of growth hormone precursors with stem cell activation therapy, thereby stimulating the pituitary gland to increase growth hormone production, will ensure two important things. Firstly, it will result in much higher efficiency in fingertip regeneration. Secondly, it will also expand the scope of this regenerative science to healthy adults of any age and perhaps lay the foundation to regenerating other body parts as well. Administration of multivitamin / mineral supplements to increase availability of nutrition in the body will also help improve the overall success rate of adult and child regenerated fingertips. What should you do in case of an old injured fingertip covered with a skin flap? "Researchers found that when they sewed full-thickness skin grafts over the stumps of amputated salamander legs, the dermis, or inner layer of the skin, acted as a barrier between the apical cap and an essential something in the leg, thereby preventing regeneration. Even a tiny gap in the barrier, however, was enough to allow regrowth." "In the early 1940s this discovery led S. Meryl Rose, then a young anatomy instructor at Smith College, to surmise that the rapid formation of full-thickness skin over the stumps of adult frogs' legs might be what prevented them from regenerating. Rose tried dipping the wounds in saturated salt solution several times a day to prevent the dermis from growing over the stump. It worked! Most of the frogs whose forelimbs he'd amputated between the elbow and wrist, replaced some of what they'd lost. Serveral regrew well-formed wrist joints, and a few even began to produce one new finger." "In 1946, Lev Vladimirovich Polezhaev, a young Russian biologist then working in London, concluded a long series of experiments in which he induced partial regeneration in adult frogs, the same success Rose had had, by pricking their limb stumps with a needle every day. Polezhaev then found that a wide variety of irritants produced the same effect, although none of them worked in mammals. His experiments indicated that making the injury worse could make regeneration better and showed that Rose's salt-in-the-wound procedure worked by irritation rather than by preventing dermis growth." Extract reproduced from "The Body Electric" by Professor Robert O. Becker, M.D., Ortopedic Surgeon, State University of New York, Syracuse, New York, 1985. Methods of improving the results achieved so far and the scope of the application of stem cell activation therapy to fingertip regeneration. By combining stem cell activation therapy with the strategy to enhance the release of growth hormones in the body; creating a gap in the dermis; and by daily pricking the fingertip, one will help to improve the chances of success in adult fingertip regeneration in mammals even if the amputation has occurred years earlier. Each prick creates a fresh point of injury which signals the body to send extra stem cells to the site and commence the regeneration process. Multiple pricks can expand the area of regeneration and cause a higher concentration of the body's own stem cells at that location. Topical application of nano silver stem cell activation gel can not only cause dedifferentiation of mature cells into fresh stem cells but can also cause enhanced production of progenitor cells. (1, 2) This will regularly drive the concentration of highly activated stem cells even higher with each daily application of the stem cell activation gel to the freshly pricked area. The earlier barriers proposed by the late Dr. Robert O. Becker, M.D., in his book "The Body Electric," 1985, that it will not work in mammals and adults are now being gradually challenged as more adult cases have begun showing encouraging results. A 23 year old female worker in a factory suffered an injury to the index finger of her right hand on January 28, 2011. Our first approach was to treat the wound with nano silver activated stem cell gel and to verify if the limitations experienced by the late Dr. Robert O. Becker, M.D., in the treatment of adults were applicable to this particular case. Treatment was started on February 02, 2011. After seeing very little progress at the end of six weeks, it was decided that the limitations experienced by Dr. Becker were equally applicable with our techniques of in vivo activating stem cells. At that stage, and on March 16th, six weeks later, we began implementing the technique of daily pricking of the finger to see if this strategy when combined with stem cell activation therapy would yield any better results. We were at this stage working on a skin covered fingertip roughly seven weeks from the date of initial injury. A review of the situation after only twelve days, showed tremendous progress which had not been seen in the previous six weeks. We then added growth hormone precursors and multivitamin / mineral supplements into the treatment to ensure quicker results. Another nine days later, we again saw a quantum jump in the regeneration of the fingertip. Two weeks later, we decided to stop the daily “pricking” procedure but to continue with topical stem cell activation therapy and with growth hormone enhancing therapy, and let nature takes it own course to bring the finger tip to its final perfection. What we can safely conclude, is that it would be advisable to add nutritional growth hormone enhancing therapy and nutritional supplements on day one of the stem cell activation therapy to enhance regeneration. It would also be advisable to add “pricking” at an appropriate time much earlier on in the treatment to ensure that the body continues to rely on its inherent regeneration capabilities. It seems possible to that the total of ten weeks of treatment time seen in this case could easily be reduced to four weeks in future adult fingertip regeneration cases. The active period of treatment in this adult case has actually been from March 16th to April 05th 2011, thereby totaling 21 days. This case can also be considered as a regeneration of an old injury fingetip as the active form of treatment wa started only after six weeks. This would again be a considerable improvement over the 90 day period taken in 1995 by the late Dr. Robert O. Becker, M.D., for regenerating the fingertip of a 21 year old male, as reported in his US Patent No. 5,814,094 (3). [Special Offer for Doctors / Patients undergoing Nano Silver Stem Cell Activated Faingertip Regeneration for the first time]. A 21 year old college student suffered an accident while riding her motorcycle. Her right hand and palm suffered maximum damage which required extensive suturing. The middle finger suffered extensive damage with total loss of nail. The ring finger showed full thickness loss of skin and soft tissue with exposed extensor tendon with fractured and crushed distal phalanx, also with total loss of nail and nail bed. An area of composite tissue deficit was created in the ring fingertip as a result of the accidental fall from her bike. Stem cell activation therapy in the form of a topical gel was immediately started on October 23, 2010. At the end of 23 days the middle finger showed excellent regeneration and was almost completed covered by a full length nail. The results acheived in this adult case are consistent with the results achieved in the case of the seven year old child and the 23 year old girl as discussed earlier. This strongly suggets that regeneration is entirely possible in 30 days with the current state of art acheived so far. However, the ring finger which had more damage did not show much progress even in terms of regeneration of tissue loss. Regeneration of the ring finger seemed an uphill battle. At this stage, further treatment was stopped by the patient. Four months later, on March 15, 2011, the patient returned with more determination. There was hardly any progress to show in the case of the ring finger, which was now completely covered with skin. It was then decided to adopt the “pricking” procedure outlined above to recommence the body's inherent regeneration process. At the same time, we restarted the topical application of the stem cell activation gel. In about 10 days the area of deficit began to fill up with fresh tissue, but no nail could be seen emerging as the nail bed was still not completely formed. At this stage, it was decided to also introduce the growth hormone enhancing therapy into the equation. Four weeks later the finger took on a healthy look but no nail was in sight. What was remarkable was that both the middle finger and the ring finger, now looked years younger than the other fingers. They had literally lost all the wrinkle lines normally seen in other fingers and the skin began looking like that of a child. What we perhaps see at this stage, four weeks after recommencing the regeneration process, are two small vertical lines emerging probably from either side of the nail bed. The nail bed still does not appear to be completely developed due to the severe mutilation of the finger. Updates to this case will be released from time to time when available. The techniques described above could also be possibly used to regenerate fingertips previously damaged and surgically treated in the past. The treatment being so very simple and risk free, it does not require complex medical skills or equipment to implement. It may be possible to have a registered nurse administer the daifly treatment under the supervision and guidance of a family physician. It would be worth pursuing the procedures outlined in these cases to begin collection of more clinical data to further develop the science of regenerating fingertips. This might lead to furthering our understanding and development of protocols for the regeneration of other body parts as well. We request readers to come forward and refer more such challenging cases to us for furthering our knowledge in this groundbreaking research. This will enable rapid progress in the field of regenerative medicine for the benefit of mankind. The local antibiotic effect of silver nano particles (4) has been well established for over 4 decades now (5). The topical application of a gel containing nano silver will help to prevent post surgical infections, dehiscence and hypertrophic scar formation at each point of entry. Daily application will cause rapid wound healing and also help maintain high surface concentration of nano silver for transdermal delivery to area under consideration for enhanced stem cell activation on an on going basis over an initial period of 8 to 12 weeks. Intracellular nutritional correction of the nutritional profile of the body to ensure adequate reserves of intracellular nutrition to carry out stem cell induced repairs in the body and anti-age various organs of the body. Also helps to reverse chronic diseases which may have caused the injury which necessitated the stem cell repair of the body. 7. Harold Brem, Marjana Tomic-Canic. Cellular and Molecular basis of wound healing in diabetes. JCI (2007), 117(5):1219–1222. PMID 17476353. 9. Sunil S Tholpady, Ramon Llull, Roy C Ogle, J Peter Rubin, J William Futrell, Adam J Katz, Adipose tissue: stem cells and beyond, Clinics in Plastic Surgery. 01/02/2006; 33(1):55-62, vi. Phyllis A. Balch, CNC and James F. Balch, M.D., Member of the American Medical Association, Fellow of the American College of Surgeons. Gel with nano silver induced stem cell activators help to dedifferentiate mature cells and also increase production of Progenitor Cells to cause rapid healing of non healing wounds, ulcers, burns, gangrene. Helps treat diabetic foot reducing greatly the risk of amputation. Made from Aloe Vera, the Gel is totally natural, and does not contain any harsh or toxic chemicals. Prevents post surgical infections and reduces scaring and wound dehiscence. [Check Photo Gallery pdf file]. Used for Finger Tip Regrowth after amputation. [Photo Gallery pdf file] and Sternal Dehiscence. It is highly recommended to use this gel in conjunction with other supporting nutrients to enhance the pace of repair work and regeneration in the body. For more info on use and application of Stem Cell Gel click here. Main Ingredients: Aloe Vera Gel and Nano Silver. Dosage: Apply liberally to cover he desired area. Apply as frequently as required and leave on overnight for best results . Highly recommend for non healing wounds, ulcers, gangrene and diabetic foot. Reduces risk of amputation. For fingertip regeneration after accidental amputation. Activated stem cells help to rapidly regenerate amputated fingertips. Good for fungal infections, nail loss and rapid nail growth. Made from Aloe Vera, the Gel is totally natural, and does not contain any harsh or toxic chemicals. Prevents infections and reduces scaring. For progressive pictures of Finger Tip Regrowth after amputation. [Photo Gallery pdf file]. For more info on use and application of Fingertip Gel click here. For toenail regeneration after accidental amputation. Activated stem cells help to rapidly regenerate amputated fingertips. Good for fungal infections, nail loss and rapid nail growth. Made from Aloe Vera, the Gel is totally natural, and does not contain any harsh or toxic chemicals. Prevents infections and reduces scaring. For progressive pictures of Finger Tip Regrowth after amputation. [Photo Gallery pdf file]. For more info on use and application of Fingertip / Toenail Gel click here. Precursor to Human Growth Hormone (HGH). Helps raise IGF-1 (Somatomedin – C) / Serum HGH values when taken over a prolonged period (typically 12 weeks). HGH is known to aid in the repair and regeneration processes in the body. [For more info on HGH Click here]. Helps to Rebuild & Regenerate Fingertips when used in conjunction with Stem Cell Activation Therapy! Essential Amino Acids help the Pituitary Gland release Growth Hormones. Helps raise IGF-1 (Somatomedin – C) / Serum HGH values when taken over a prolonged period (typically 12 weeks). HGH is known to aid in the repair and regeneration processes in the body. To enhance the effect of this Amino Acid, it is fortied with Powerful Antioxidant like Organic Fat soluble Vitamin C. [For more info on HGH Gel Click here]. Ingredients: Aloe Vera Gel, Arginine, Glutamine, Lysine, Ornithine, Tyrosine, Vitamin Serum C and Organic Chromium. Dosage: Apply 12 drops (0.50g) 2 peas sized amount containing an average of 200mg/g of Arginine; 25mg/g each of Glutamine, Lysine, Ornithine, Tyrosine; 50mg/g of Serum C; and 100mcg/g of Organic Chromium in the morning after bath and at bedtime. Helps increase Stem Cell Concentration levels in the body to aid in the process of repair and regeneration. Naturally enhances Stem Cell Production. Essential Amino Acid. This Dietary Supplement helps the Pituitary Gland release Growth Hormones to start the process of Repair and Regeneration. To enhance the effect of this Amino Acid, it is fortified with Powerful Antioxidant like Organic Fat soluble Vitamin C and other Growth Hormone producing and Energizing Herbs. Helps Naturally Increases Growth Hormone Levels. Multi-Vitamin / Mineral Supplement designed to deliver prescription strength therapeutic doses at intracellular levels. Helps deliver nutritional support to help stem cell assisted repair and regeneration to work with higher rate of efficiency and success. Helps Increase available nutritional levels to assist stem cell repair and regeneration.